The Vanguard was designed to create evolving beds of sound; from thick and sweeping harmonics to symphonic tidal waves. It operates as a series phaser system - two phasers working together to give unimaginable texture. The user has three selectable modes to shape the series phaser, sending your signal through a single 10-stage phaser with the option to pass through a second phaser. The second phaser, found on the second row of rotary controls, offers three different phaser voicings at the flip of a toggle switch; 10-stage with regeneration, 6-stage with pitch bend, and 4-stage with filter. This generates anything from slow phased foothills to untamed and violent sweeps. The Vanguard gives you eight controls in total. Though it offers many options, it is simple and intuitive to use. If you desire to use only one of the four phasers on the Vanguard (one main phaser with the top controls and three selectable phaser voicings on the bottom row of controls), simply set the undesired phasers controls to zero and set the desired phasers controls to your unique setting. 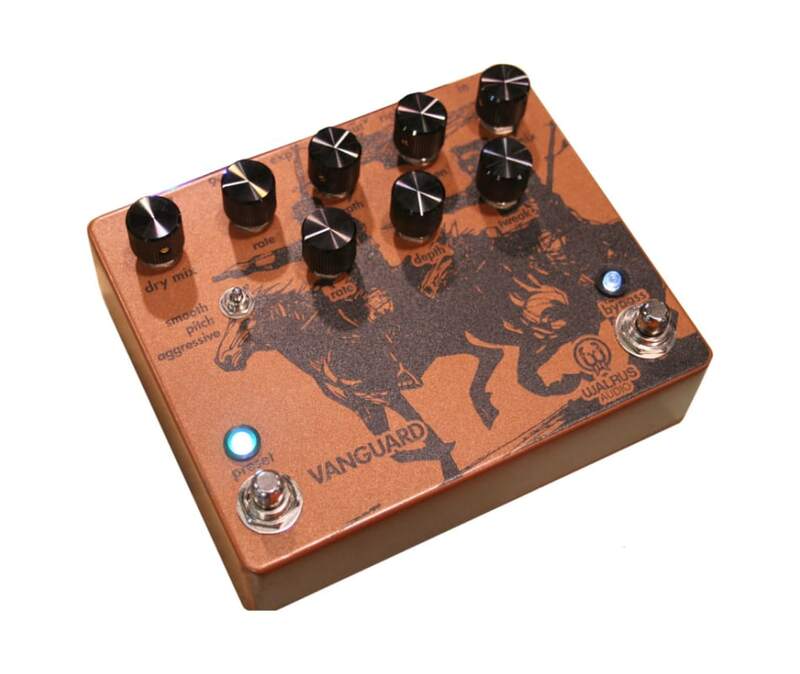 On the topside of the Vanguard the user can run one input (stereo with TRS-Y cable), two outputs, expression control, and a Remote input to use of an auxiliary momentary switch to both switch the pedal on/off and/or save presets. If you already have a crowded pedal board, you can set your Vanguard at the back of the board and run a small footprint dual SPST switch to the front of the board so you dont lose valuable real estate. The Remote input requires a TRS cable to be used. The expression pedal control works with most on-the-shelf expression pedals. This feature allows the user to set the high and low parameters for any control and then fade between those settings by moving your foot up or down on the expression pedal. Exact size of the hardy enclosure is 5-5/8" x 4-5/8" x 1-1/2"